I was emailed by Margery a few weeks ago, saying “My husband and I need a Christmas photo, but are not the type to pose in matching sweaters in a studio. 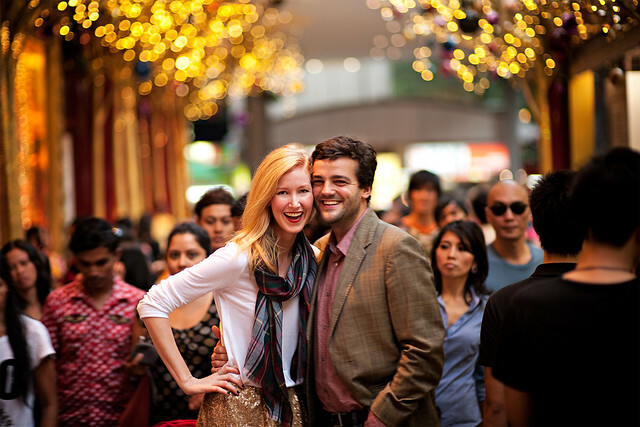 All we really need is one good shot of us in the midst of the chaos that is Orchard Road. 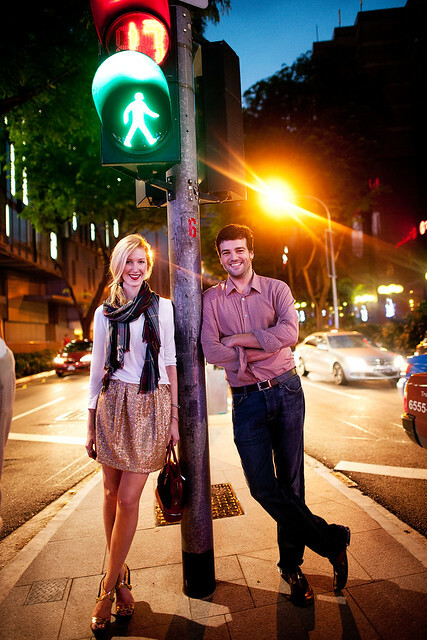 We are after a photo that is casual and captures us in the heart of Singapore.” I was instantly interested and took the job. She further added that she preferred to incorporate some of the Christmas decors in Orchard. So I scheduled the shoot on a Saturday at 630pm onward coz that’s the time the decors light up. Fortunately for me, I’ve rented out a Nikon D3X for another client shoot earlier that day. 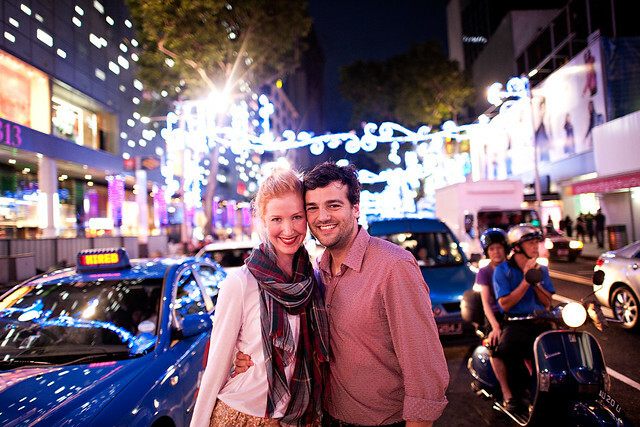 The D3X (partnered with the 85mm f1.4 and 24mm f1.4 lenses) was perfect for shooting at night without flash in the streets – it handled very well in low light conditions. I told them they’d have to prepare for a long walk coz we’ll be going around Orchard for an hour or so. They were up for it. When we were shooting, they were very comfortable in front of the camera. I gave very little direction as all I had to do was tell them where to stand. They were so easy to photograph. What a beautiful couple. Normally I do not read post on blogs, however I would like to say that this write-up very forced me to take a look at and do it! Your writing taste has been surprised me. Thank you, quite great post. You made various nice points there. I did a search on the subject and found mainly people will consent with your blog. hey there and thank you for your information – I’ve certainly picked up something new from right here. I did however expertise some technical issues using this web site, as I experienced to reload the site many times previous to I could get it to load properly. I had been wondering if your web hosting is OK? Not that I’m complaining, but slow loading instances times will very frequently affect your placement in google and can damage your high-quality score if ads and marketing with Adwords. Anyway I’m adding this RSS to my email and could look out for much more of your respective exciting content. Ensure that you update this again soon..
Hello.This article was extremely remarkable, especially because I was searching for thoughts on this topic last Wednesday. I am just writing to make you be aware of what a really good encounter my wife’s child went through studying your site. She noticed a good number of pieces, not to mention how it is like to have a wonderful coaching mindset to get most people without problems know a variety of problematic subject matter. You actually exceeded her expected results. Thank you for churning out such priceless, healthy, educational as well as fun thoughts on this topic to Kate. Nice post. I was checking continuously this blog and I am impressed! Very useful info specifically the last part :) I care for such info much. I was seeking this particular information for a long time. Thank you and best of luck. Excellent goods from you, man. I’ve understand your stuff previous to and you are just extremely excellent. I really like what you’ve acquired here, certainly like what you are saying and the way in which you say it. You make it entertaining and you still take care of to keep it wise. I can’t wait to read far more from you. This is actually a terrific site. I am writing to let you know of the magnificent experience my wife’s child found reading through your webblog. She discovered numerous things, with the inclusion of how it is like to possess an incredible helping heart to make others without problems know precisely specified problematic subject matter. You actually surpassed her desires. Thanks for providing such helpful, trustworthy, edifying as well as fun tips about this topic to Emily. You could certainly see your expertise in the paintings you write. The sector hopes for even more passionate writers like you who are not afraid to mention how they believe. All the time go after your heart. I have been checking out a few of your articles and i can state pretty nice stuff. I will surely bookmark your website. Its like you read my mind! You appear to know a lot about this, like you wrote the book in it or something. I think that you can do with some pics to drive the message home a little bit, but other than that, this is excellent blog. A fantastic read. I will certainly be back. you’re actually a excellent webmaster. The web site loading velocity is incredible. It seems that you are doing any unique trick. Also, The contents are masterpiece. you’ve performed a fantastic activity on this matter! I simply want to tell you that I am just newbie to weblog and really loved your website. More than likely I’m going to bookmark your website . You certainly come with amazing posts. Cheers for sharing with us your web-site. Thanks for your whole work on this web site. Kim really likes engaging in investigations and it is easy to understand why. We all learn all concerning the dynamic ways you make important things through this web blog and as well attract response from other ones on the theme and my child is without question discovering a lot. Enjoy the remaining portion of the year. You have been conducting a terrific job. Hi there, just became aware of your blog through Google, and found that it’s truly informative. I’m going to watch out for brussels. I will appreciate if you continue this in future. A lot of people will be benefited from your writing. Cheers! Great site. A lot of helpful information here. I¡¦m sending it to some pals ans additionally sharing in delicious. And obviously, thank you on your sweat! whoah this weblog is fantastic i love reading your articles. Stay up the good work! You understand, lots of people are hunting around for this info, you can help them greatly. whoah this weblog is great i really like studying your articles. Stay up the great work! You already know, many people are searching round for this information, you could help them greatly. Hiya, I am really glad I have found this information. Today bloggers publish just about gossips and web and this is really annoying. A good website with interesting content, this is what I need. Thank you for keeping this site, I will be visiting it. Do you do newsletters? Can not find it. You really make it seem so easy along with your presentation but I find this matter to be really one thing that I feel I would by no means understand. It sort of feels too complex and very broad for me. I’m taking a look forward in your subsequent post, I¡¦ll try to get the hold of it! I was just looking for this info for some time. After 6 hours of continuous Googleing, at last I got it in your site. I wonder what’s the lack of Google strategy that don’t rank this type of informative sites in top of the list. Normally the top web sites are full of garbage. My husband and i got really ecstatic that Ervin could do his investigations out of the ideas he acquired in your site. It’s not at all simplistic to simply choose to be handing out points which often many others could have been making money from. And we all take into account we have got the blog owner to thank for that. Most of the illustrations you have made, the simple blog navigation, the relationships you will help to create – it’s got everything powerful, and it is helping our son in addition to the family recognize that the matter is awesome, and that is tremendously important. Thanks for everything!